Mobile needed a pick-me-up, and Patrick Sandoval stepped up to answer the call. The 12th-ranked Angels prospect struck out a career-high 11 while scattering four hits and two walks over five innings to help the Double-A BayBears salvage a split against the Braves on Sunday with a 2-0 victory in eight innings. Sandoval's 11 whiffs surpassed his previous high of nine, which he amassed three times, most recently July 29 in his first appearance for the Class A Advanced Inland Empire 66ers after being acquired by the Angels in exchange for Martin Maldonado. The left-hander's repertoire consists of a fastball, a curveball, a changeup and a slider. On Sunday, he found all three of his off-speed pitches to be working in his favor. "My changeup was the go-to," he said. "As I progress with my development, my goal is to not really have a true go-to pitch and have the ability to go to any pitch at any moment and be even more effective. ... I felt after the first inning that I had all three off-speed pitches working, and if I could execute them that it would be a fun day." Sandoval -- who was an Astros' 11th-round selection in the 2015 Draft -- struck out at least two batters in four innings, including three whiffs in the first and third frames. Braves No. 8 prospect Drew Waters, No. 23 CJ Alexander and Jonathan Morales were victimized twice by the 6-foot-3 left-hander and Mississippi never advanced a runner past second base in the game. "My mind-set when I'm on the mound is to put hitters away as quick as possible," he said. "I throw all my stuff with as much intent as possible." The native of Mission Viejo, California, threw 55 of 87 pitches for strikes. "I want to be able to control whatever I can and not let things out of my control get in the way of my process out there," Sandoval said. 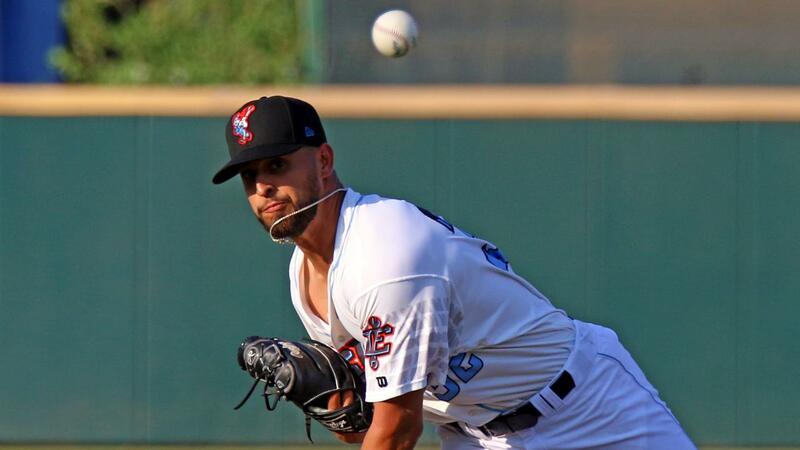 Mobile ended a skid of 18 scoreless innings in the eighth. In the extra frame, Jahmai Jones, Los Angeles' fourth-ranked prospect, began as the runner on second. Third-ranked Brandon Marsh, laced a base hit to center before No. 24 Jack Kruger singled to left to bring in Jones. Brendon Sanger dropped a soft single to right to load the bases and Roberto Baldoquin's sacrifice fly to right plated Marsh. The one-time Southern California commit praised catcher Kruger for his input throughout the game. "It definitely makes it harder [on batters] when you have a guy like Kruger behind the plate," Sandoval said. "He can not only receive any pitch and make it look close, but he is unbelievably savvy with how he calls the game." Knowing the offense has been scuffling did not affect Sandoval's approach. "Pitchers know hitting is probably the hardest thing to do in sports," he said. "My mind-set is that I'm gonna go out there and do my job to the best of my ability. ... I have all the trust in the world in our offense. We do have a pretty stacked lineup, so I'm sure we'll see them explode in the very near future." Joe Gatto (1-0) picked up the win with two innings of flawless relief, including three punchouts. Ryan Clark chalked up his first save with a 1-2-3 inning bookended by strikeouts. Jeremy Walker (0-1) took the loss after allowing two runs on five hits with six strikeouts in five innings. Mississippi won the opener, 1-0, as Atlanta's No. 13 prospect Kyle Muller, Jonathan Aro and Josh Graham combined on a two-hitter.